Marinetti's impassioned polemic immediately attracted the support of the young Milanese painters —Boccioni, Carrà, and Russolo—who wanted to extend Marinetti's ideas to the visual arts (Russolo was also a composer, and introduced Futurist ideas into his compositions). The painters Balla and Severini met Marinetti in 1910 and together these artists represented Futurism's first phase. "We will fight with all our might the fanatical, senseless and snobbish religion of the past, a religion encouraged by the vicious existence of museums. We rebel against that spineless worshiping of old canvases, old statues and old bric-a-brac, against everything which is filthy and worm-ridden and corroded by time. We consider the habitual contempt for everything which is young, new and burning with life to be unjust and even criminal." "The cry of rebellion which we utter associates our ideals with those of the Futurist poets. These ideas were not invented by some aesthetic clique. They are an expression of a violent desire, which burns in the veins of every creative artist today. ... We will fight with all our might the fanatical, senseless and snobbish religion of the past, a religion encouraged by the vicious existence of museums. We rebel against that spineless worshipping of old canvases, old statues and old bric-a-brac, against everything which is filthy and worm-ridden and corroded by time. We consider the habitual contempt for everything which is young, new and burning with life to be unjust and even criminal." They repudiated the cult of the past and all imitation, praised originality, "however daring, however violent", bore proudly "the smear of madness", dismissed art critics as useless, rebelled against harmony and good taste, swept away all the themes and subjects of all previous art, and gloried in science. Their manifesto did not contain a positive artistic programme, which they attempted to create in their subsequent Technical Manifesto of Futurist Painting. The Technical Manifesto committed them to a "universal dynamism", which was to be directly represented in painting. Objects in reality were not separate from one another or from their surroundings: "The sixteen people around you in a rolling motor bus are in turn and at the same time one, ten four three; they are motionless and they change places. ... The motor bus rushes into the houses which it passes, and in their turn the houses throw themselves upon the motor bus and are blended with it." Boccioni's The City Rises (1910) represents scenes of construction and manual labour with a huge, rearing red horse in the centre foreground, which workmen struggle to control. His States of Mind, in three large panels, The Farewell, Those who Go, and Those Who Stay, "made his first great statement of Futurist painting, bringing his interests in Bergson, Cubism and the individual's complex experience of the modern world together in what has been described as one of the 'minor masterpieces' of early twentieth century painting." (Humphreys, R. Futurism, Tate Gallery, 1999) The work attempts to convey feelings and sensations experienced in time, using new means of expression, including "lines of force", which were intended to convey the directional tendencies of objects through space, "simultaneity", which combined memories, present impressions and anticipation of future events, and "emotional ambience" in which the artist seeks by intuition to link sympathies between the exterior scene and interior emotion. Futurism had from the outset admired violence and was intensely patriotic. The Futurist Manifesto had declared, "We will glorify war - the world's only hygiene - militarism, patriotism, the destructive gesture of freedom-bringers, beautiful ideas worth dying for, and scorn for woman." Although it owed much of its character and some of its ideas to radical political movements, it was not much involved in politics until the autumn of 1913. Then, fearing the re-election of Giolitti, Marinetti published a political manifesto. In 1914 the Futurists began to campaign actively against the Austro-Hungarian empire, which still controlled some Italian territories, and Italian neutrality between the major powers. In September, Boccioni, seated in the balcony of the Teatro dal Verme in Milan, tore up an Austrian flag and threw it into the audience, while Marinetti waved an Italian flag. After the war, Marinetti attempted to revive the movement in il secondo Futurismo. Futurist Antonio Sant'Elia has probably been the most influential architect of the twentieth century. 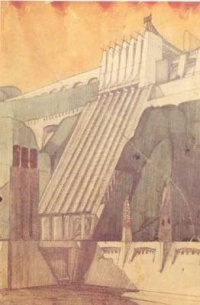 His idea of modernity was expressed in his series of drawings for "La Città Nuova" ("The New City") project (1912-1914). Cubo-Futurism was the main school of Russian Futurism which imbued influence of Cubism and developed in Russia in 1913. Like their Italian predecessors, the Russian Futurists — Velimir Khlebnikov, Aleksey Kruchenykh, Vladimir Mayakovsky, David Burlyuk — were fascinated with dynamism, speed, and restlessness of modern urban life. They purposely sought to arouse controversy and to attract publicity by repudiating static art of the past. The likes of Pushkin and Dostoevsky, according to them, should have been "heaved overboard from the steamship of modernity". They acknowledged no authorities whatsoever; even Marinetti, principles of whose manifesto they adopted earlier — when he arrived to Russia on a proselytizing visit in 1914 — was obstructed by most Russian Futurists who now did not profess to owe anything to him. In contrast to Marinetti's circle, Russian Futurism was a literary rather than artistic movement. Although many leading poets (Mayakovsky, Burlyuk) dabbled in painting, their interests were primarily literary. On the other hand, such well-established artists as Mikhail Larionov, Natalia Goncharova, and Kazimir Malevich found inspiration in the refreshing imagery of Futurist poems and experimented with versification themselves. The poets and painters attempted to collaborate on such innovative productions as the Futurist opera Victory Over the Sun, with texts by Kruchenykh and sets contributed by Malevich. The movement began to waste away after the revolution of 1917. Many prominent members of the Russian Futurism emigrated abroad. Artists like Mayakovsky and Malevich become the prominent members of the Soviet establishment and Agitprop of the 1920s. Others like Khlebnikov were persecuted for their beliefs. Luigi Russolo (1885-1947) wrote The Art of Noises (1913), which is considered to be one of the most important and influential texts in 20th century musical aesthetics. Russolo used instruments he called intonarumori, which were acoustic noise generators that permitted the performer to create and control the dynamics and pitch of several different types of noises. Russolo and Marinetti gave the first concert of Futurist music, complete with intonarumori, in 1914. Futurism was one of several 20th century movements in art music that paid homage to, included or imitated machines. Feruccio Busoni has been seen as anticipating some Futurist ideas, though he remained wedded to tradition. Russolo's intonarumori influenced Stravinsky, Honegger, Antheil, Edgar Varèse, Stockhausen and John Cage.Template:Fact In Pacific 231, Honegger imitated the sound of a steam locomotive. There are also Futurist elements in Prokofiev's The Steel Step. Futurism as a literary movement made its official debut with F.T. Marinetti's Manifesto of Futurism (1909), as it delineated the various ideals Futurist poetry should strive for. Poetry, the predominate medium of Futurist literature, can be characterized by its unexpected combinations of images and hyper-conciseness (not to be confused with the actual length of the poem). Theater also has an important place within the Futurist universe. Works in this genre have scenes that are few sentences long, have an emphasis on nonsensical humor, and attempt to discredit the deep rooted traditions via parody and other devaluation techniques. The longer forms of literature, such as the novel, had no place in the Futurist aesthetic of speed and compression. Many Italian Futurists instinctively supported the rise of Fascism in Italy in the hope of modernizing the society and the economy of a country that was still torn between unfulfilled industrial revolution in the North and the rural, archaic South. Marinetti founded the Partito Politico Futurista (Futurist Political Party) in early 1918, which only a year later was absorbed into Benito Mussolini's Fasci di combattimento, making Marinetti one of the first supporters and members of the National Fascist Party. However, he opposed Fascism's later canonical exultation of existing institutions, calling them "reactionary", and, after walking out of the 1920 Fascist party congress in disgust, withdrew from politics for three years. Nevertheless, he stayed a notable force in developing the party thought throughout the regime. Some Futurists' aestheticization of violence and glorification of modern warfare as the ultimate artistic expression and their intense nationalism also induced them to embrace Fascism. Many Futurists became associated with the regime in the 1920s, which gave them both official recognition and the ability to carry out important works, especially in architecture. Throughout the Fascist regime Marinetti sought to make Futurism the official state art of Italy but failed to do so. Mussolini was personally uninterested in art and chose to give patronage to numerous styles and movements in order to keep artists loyal to the regime. Opening the exhibition of art by the Novecento Italiano group in 1923 he said, "I declare that it is far from my idea to encourage anything like a state art. Art belongs to the domain of the individual. The state has only one duty: not to undermine art, to provide humane conditions for artists, to encourage them from the artistic and national point of view." Mussolini's mistress, Margherita Sarfatti, who was as able a cultural entrepreneur as Marinetti, successfully promoted the rival Novecento group, and even persuaded Marinetti to sit on its board. Although in the early years of Italian Fascism modern art was tolerated and even embraced, towards the end of the 1930s, right-wing Fascists introduced the concept of "degenerate art" from Germany to Italy and condemned Futurism. Some leftists who came to Futurism in the earlier years continued to oppose Marinetti's artistic and political direction of Futurism. Leftists continued to be associated with Futurism right up until 1924, when the socialists, communists, anarchists and anti-Fascists finally walked out of the Milan Congress, and the anti-Fascist voices in Futurism were not completely silenced until the annexation of Ethiopia and the Italo-German Pact of Steel in 1939. Futurism expanded to encompass many artistic domains and ultimately included painting, sculpture, ceramics, graphic design, industrial design, interior design, theatre design, textiles, drama, literature, music and architecture. In architecture, it was characterized by a distinctive thrust towards rationalism and modernism through the use of advanced building materials. In Italy, futurist architects were often at odds with the Fascist state's tendency towards Roman imperial/classical aesthetic patterns. 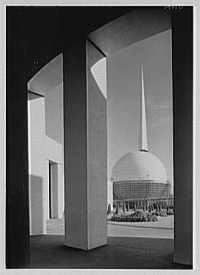 However several interesting Futurist buildings were built in the years 1920–1940, including many public buildings: stations, maritime resorts, post offices, etc. See, for example, Trento's railway station built by Angiolo Mazzoni. Tullio Crali, a self-taught painter, was a late adherent to Futurism, not joining until 1929. He is noted for his realistic aeropaintings, which combine "speed, aerial mechanisation and the mechanics of aerial warfare". (Osborn) His earliest aeropaintings represent military planes, Aerial Squadron and Aerial Duel (both 1929), in appearance little different from works by Prampolini or other Futurist painters. In the 1930s, his paintings became realistic, intending to communicate the experience of flight to the viewer. His best-known work, Nose Dive on the City (1939), shows an aerial dive from the pilot's point of view, the buildings below drawn in dizzying perspective. A revival of sorts of the Futurist movement began in 1988 with the creation of the Neo-Futurist style of theatre in Chicago, which utilizes Futurism's focus on speed and brevity to create a new form of immediate theatre. Currently, there are active Neo-Futurist troupes in Chicago and New York. Unless indicated otherwise, the text in this article is either based on Wikipedia article "Futurism" or another language Wikipedia page thereof used under the terms of the GNU Free Documentation License; or on original research by Jahsonic and friends. See Art and Popular Culture's copyright notice. This page was last modified 21:42, 6 September 2013.